﻿ India pilots resolutions on Single-use Plastics and Sustainable Nitrogen management at Fourth United Nations Environment Assembly. India pilots resolutions on Single-use Plastics and Sustainable Nitrogen management at Fourth United Nations Environment Assembly. 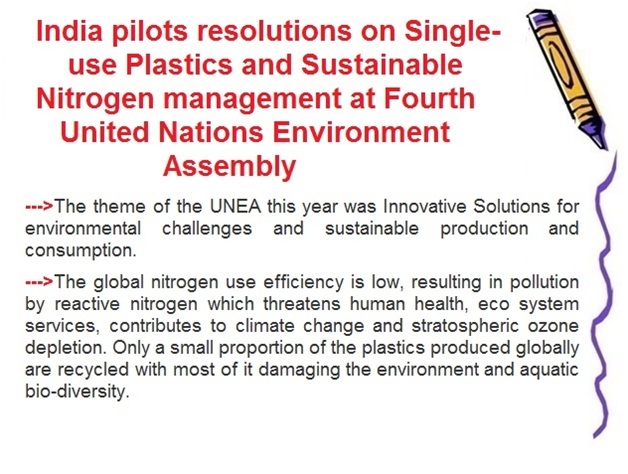 In a significant first, India piloted resolutions on two important global environment issues relating to Single-use Plastics and Sustainable Nitrogen management at the fourth session of United Nations Environment Assembly (UNEA) which was held in Nairobi from 11th to 15th March 2019.UNEA adopted both the resolutions with consensus. The theme of the UNEA this year was Innovative Solutions for environmental challenges and sustainable production and consumption.